All games follow FFA small sided football regulations so outs, kick-ins, corners and no overhead height rules apply. Forget spending your Saturdays driving around Sydney. All games are played on Saturday mornings at Ultimate Soccer’s $4m state-of-the-art facility with a clubhouse that includes a servery, lounge facilities & FREE parking. Parents can finally sit back and enjoy the action. Each team is provided a fully qualified coach to help structure and manage the team. Plus QUALIFIED REFEREE officials are also supplied for each game. Receive great value for money with 15 weeks of games & FREE premium kits including game day & training shirts, shorts, socks, bag & shirt printing. Ultimate Soccer are launching NEW Junior Outdoor “Easy” Leagues for the 2019 football season! Under 6 up to Under 12 teams and individuals are invited to register for this new football season that kicks off in May 2019. All games will be played at Ultimate Soccer Fairfield, which is a state-of-the-art $4,000,000 soccer complex that includes a modern clubhouse and free parking. No more travelling around Sydney to play games at second rate facilities! Competitions run in the same format as other football association outdoor junior leagues and in accordance with FFA Small Sided Game rules and regulations. We will convert our all-weather FIFA grade synthetic turf fields to the required small sided pitch dimensions. Matches will be played on Saturday mornings at Ultimate Soccer Fairfield with kick-off times between 8.30am and 10.30am. All teams will have a qualified coach supplied by Ultimate Soccer to ensure each team is well organised and managed, and players are motivated to have fun and enjoy their football experience. FFA qualified referees will officiate all matches to ensure Saturday mornings become an easy pain-free experience for parents. League tables and fixture times will be arranged by Ultimate Soccer and will be available to see through the Boot Room on our website. Finally, and best of all, all junior players will be kitted out with a premium football kit, training kit and football bag! Competitions run for 15 weeks with one game per week, the season will kick-off on Saturday, 4th May. We will accept team and individual player registrations with spaces for each age group limited. So please register now, as spaces are on a first-come, first-served basis! Register now and get amazing value! Take action now and see how easy life can be with Ultimate Soccer’s New Junior Outdoor Easy Leagues. Register your interest in the enquiry box (to the right) to get more information and a FREE TRIAL. Our professional coaches run 15-week coaching sessions using top quality state-of-the art equipment such as speed guns, parachutes and slalom mannequins to keep sessions engaging & fun. We also record the sessions via Go-Pro and drone to send to parents along with photos of the sessions. Wednesday, 1st May at 5.30pm. Coaching Clinics will run during the week to complement our New Junior Outdoor Easy Leagues. The 15-week program will be specifically designed for beginner and intermediate players and focus on developing technique, game understanding, improving confidence and, most importantly, providing a friendly environment that promotes a fun learning experience where players make good friends, are active and learn and develop a passion for football. Why not play and train at our coaching clinics for the 15-week duration of the football season with our FFA C license qualified coach for an additional $170?! 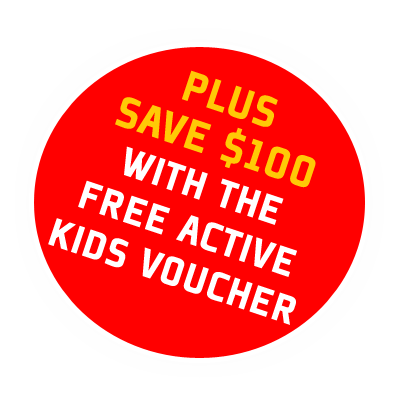 Ultimate Soccer is now an Active Kids provider, which means that all parents can redeem a FREE $100 voucher to put towards the cost of playing and coaching! Parents, guardians and carers can apply for a voucher valued up to $100 per calendar year for each student enrolled in school. Click on this link to apply or call Ultimate Soccer for more information on how to apply. Opt-in, refer to Terms & Conditions* By pressing the SEND button you are making an enquiry to Ultimate Soccer for more information. You are NOT registering for a league competition or making a booking.